Rarely do you come across someone who has a negative opinion about Bali. More often than not, you will find previous visitors raving about Bali as magical, some suggest it is spiritual, and others find it relaxing, or even full of adventure. It is a place I have come to love and enjoy returning too often. But its magic is no secret, and anyone who has spent an evening on Kuta Beach will discover themselves among about 600 other soul-searchers... or perhaps just partying Australian 20-somethings. But I got a tip—sort of a do-not-tell-anyone whisper—of a still secret place on the island of Bali, which is less crowded, quiet and less touristy than the popular destinations of Kuta, Sanur and Ubud. 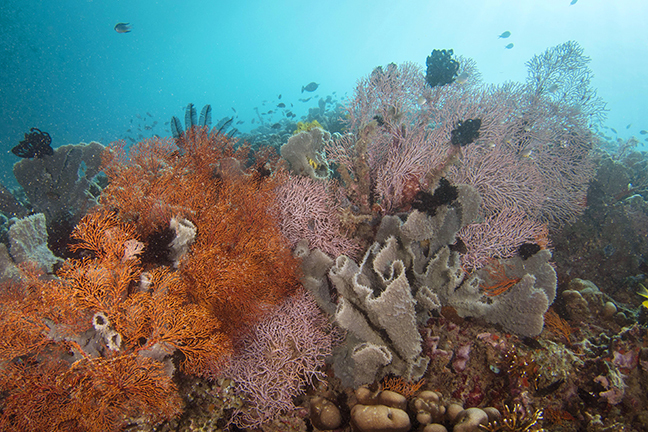 Healthy reef at Pemuteran, Bali, Indonesia. Photo by Brandi Mueller. After braving a few days among the masses in these areas, I headed northwest. The hair-raising, four-and-a-half-hour drive up and around two volcanoes showed me one reason why not many people make the trek this far from the airport. But my arrival under a blanket of stars with the sound of soft waves crashing as I went to sleep had me thinking that the long ride to Reef Seen Divers’ Resort had been worth it. Waking up on my first morning, I walked out of my bungalow into the early morning light. 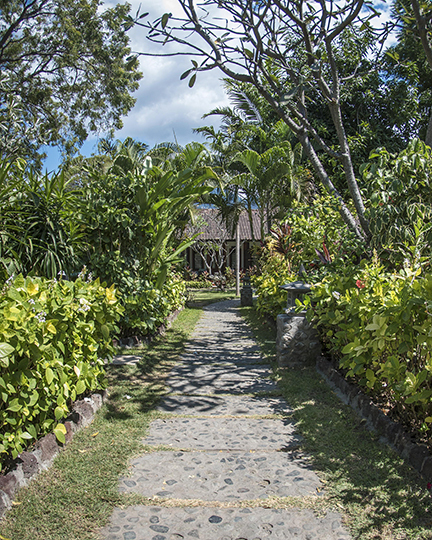 The snug resort had eight rooms nestled among flowering trees and stone pathways that connected the rooms, restaurant and dive shop. A short walk led me past the turtle hatchery (more on that later) and I got a quick glimpse of two just-hatched turtles wandering around the sand enclosure. I made my way to breakfast and enjoyed my coffee while overlooking the beach. Admiring the view and finding a new level of calmness, I headed over to the dive shop to get ready to dive. The island of Bali and all of Indonesia fall within the Coral Triangle, which is the most biodiverse marine area on Earth. I was excited to get in the water and see it for myself. The lovely crew was all smiles, as they helped me and the other divers get our gear ready. Then we walked just a few feet on the beach to the boat and headed out for our first dive. I only had three days of diving to explore this secret paradise, which almost did not feel like Bali at all. Heading out about ten minutes by boat, our first dives were at sites called Close Encounters and Napoleon Reef. 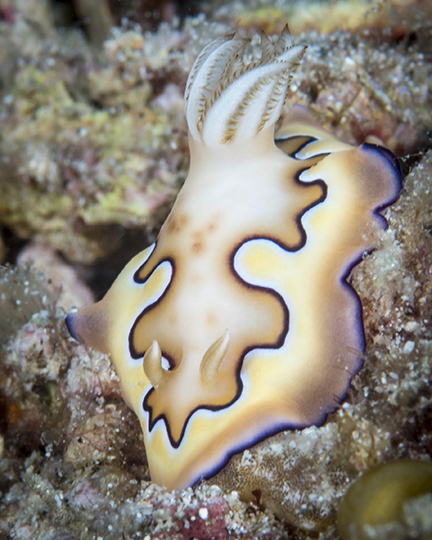 Both were lovely natural reefs with lots of marine life, including some rare creatures such as nudibranchs, flatworms, tiny egg cowries, ribbon eels and a baby whitetip reef shark no more than a foot long, wedged under a coral ledge. I spent my afternoon relaxing and napping until just before dusk when it was time for a night dive. During the briefing, Amanda, one of Reef Seen’s long-time managers, told us we would be diving just down the beach from Reef Seen under the fishing dock, which was a muck dive that had some incredible resident creatures. As we geared up, the sun was just setting, and the whole sky turned bright pinkish-orange, reflecting on the water as it faded to dark. Accessible by boat at high tide, we were going for a dive during a very low tide, so we walked in from shore. 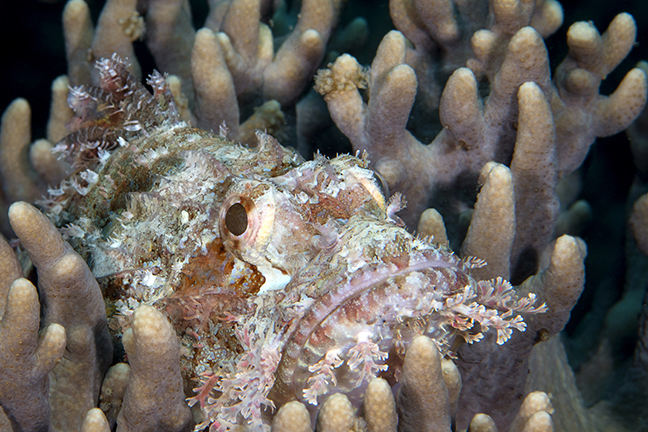 The black sand muck dive was an endless treasure hunt, with finds that included a frogfish, two long-armed octopuses, a cuttlefish, harlequin ghost pipefish and more—all in water less than 10m (30ft). An hour later, none of us wanted to get out. The majority of the dive sites Reef Seen visits are no more than a ten-minute boat ride away, allowing divers on the boat to come back in between dives to get dry, relax and enjoy the view. As I settled into a peaceful state, I started chatting with Reef Seen owner Chris Brown, and quickly learned that Reef Seen has another side, which is not just about lying around relaxing in the sunshine or enjoying cool Bintangs on the beach. On my second day of diving, we set out to see some of the numerous environmental and cultural projects Reef Seen has built. Chris opened Reef Seen 25 years ago, after finding the paradisiacal spot and deciding to stay. With illusions of relaxing and enjoying life on the small corner of Bali, he soon realized there were some problems occurring, and being a problem solver, he set out to fix them. The program, still active today, aims to use education and dive training to train local fishermen and other members of the community in sustainable fishing practices and reef conservation and recovery. With funding from the Australian government, he was able to create a team of young people who became divers, were educated about the reef, assisted in reef protection projects and further educated the rest of the community in all of the above. The Reef Gardener projects have included removing crown-of-thorns starfish and drupella shells; learning how to assist in repairing coral damaged by anchors, careless divers, nets and even natural causes such as storms; and helping in creating the artificial reefs in the area: BioWreck, Temple Garden and the Garden of the Gods. The program certified the participants through Rescue Diver qualifications, and many of these people have gone on to work in the local dive community and throughout Asia. Dive operations love to be able to hire dive guides with knowledge of the reef and trained in conservation. Training through Reef Gardeners made it easy for the program’s participants to secure those jobs, making it a win-win situation for the dive businesses and the local community. I wanted to see some of the projects Reef Seen and Reef Gardeners had created, so on my second day of diving, we visited an artificial reef project known as Temple Gardens. Being the first dive operation in the area, Chris realized throughout the years that as tourism increased, more dive sites were needed in the area. If the increasing number of divers continued to only dive a few locations, it would likely have detrimental effects on those areas. Using the concept of building an artificial reef to encourage coral and marine life expansion, Chris also incorporated the local culture. Instead of just sinking a ship or concrete blocks, his dream was to build an underwater temple. Securing funding from the Bali Rehabilitation Fund (established by Aus Aid) after the Bali bombings, Chris and the Reef Gardeners were able to build the underwater temple in 2005. Before back-rolling into the water, you can see the remains of a temple on the hill directly in front of the dive site. While descending into the blue, you start to make out the shapes of the temple layout. Due to some winds and high surf, visibility was not perfect for my dive, but the milky water almost added a mystical ambience to the scene. A sort of underwater mist settled on what seemed to be an ancient underwater temple. Divers can still see the gate keepers and swim through the entrance’s split gate—one side of which was crumbling a little, which seemed fitting. 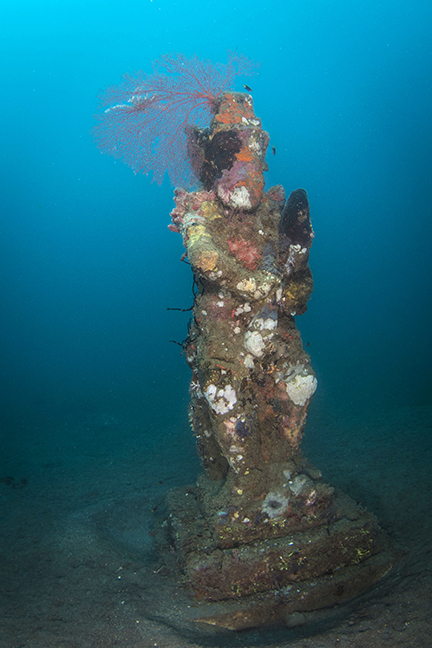 A statue of the deity Ganesha was in the center of the underwater temple, with statues of other gods and goddesses as well as sea turtles and other figures surrounding it. The bright pink gorgonians were so thick, you could not make out parts of the statues. But I could not help but love how the ocean had decorated this underwater temple. I would like to think the gods were quite pleased with it. More than ten large stone statues could be found at around 26m (85ft) on a sandy bottom near a reef wall. Twelve years after its creation, it would be easy for a diver to swim past this area and miss it entirely, because the ocean will have decorated the statues with gorgonian sea fans, encrusting it with colorful sponges and covering some of the recognizable features with purple barrel sponges. Fish swarmed the statues. 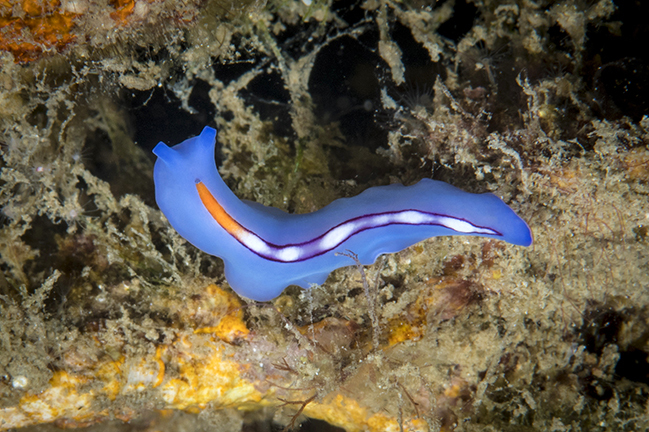 Looking closely, we saw several species of nudibranchs and even an electric clam in one of the statues. 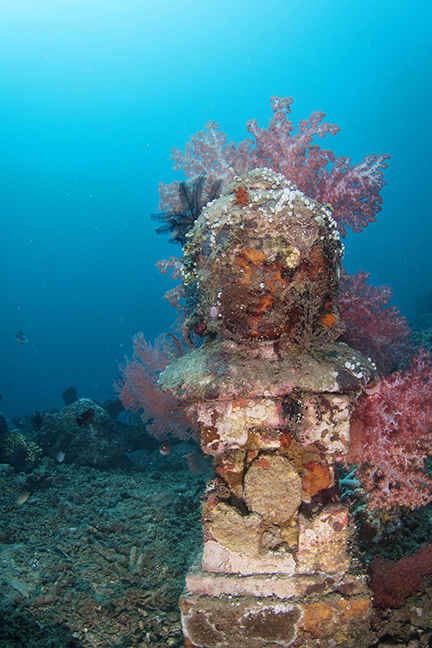 A quick Google search on the underwater Balinese Temple reveals a funny story from 2010 when many articles falsely reported that a true ancient underwater temple had been found. Many news agencies picked up the story before it was corrected to more accurately report that the temple was recently created and not an ancient archaeological discovery. Either way, it was one for my list of favorite dive experiences. I cannot fully explain how much I enjoyed this dive site. Visiting temples is part of what one does in Bali, and to combine the spirituality of Bali with the ocean seemed like a perfect idea to me. Returning to the dive resort after visiting the Temple Garden, I was in a state of spiritual bliss. The short boat ride under sunshine and clear skies was pleasant. As we pulled up on the beach, I noticed a lot of people gathered right at the shore break, looking at the sand. As we got closer, I asked our dive guide what was going on, and he said they were releasing baby turtles! I knew Reef Seen had a turtle project, but had not had time to learn more about it yet. Getting out of the boat, we watched a family with two children place two turtles in the sand and the turtles make their way to the water. As a wave washed over them, they disappeared, and we observed their little heads poke up from the water to breathe a few times before disappearing off into the horizon. Sea turtles have a rough childhood. Female turtles bury their eggs in the sand on beaches where they are susceptible to predation by animals that dig them up. On today’s beaches, it is not only wild animals but also stray dogs, and even humans, that are doing the digging. Sea turtle eggs are sold in certain Asian markets, where they are believed to have unproven medicinal benefits. If the baby sea turtles made it through to hatching, they then must dig themselves out of the sand and crawl as quickly as they can to the ocean. 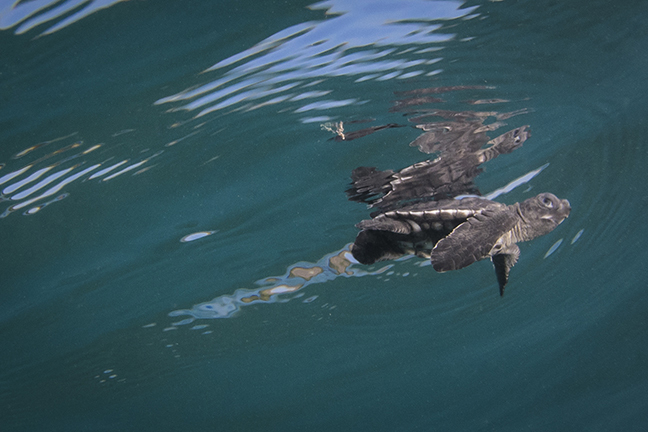 The small sea turtles are faced with predators while still on the beach as well as once they get in the water. Artificial lights on land have been known to confuse sea turtles as to which direction they must go, and so sometimes they do not go to the water. Reef Seen saw the problem of locals using turtle eggs as food, or sold for money, as an opportunity to work together with the community to save the sea turtles. The idea was to make sea turtles worth more alive than dead. They began offering monetary awards to locals for reporting sea turtle nests. Now the community shares information with Reef Seen about where the sea turtle nests are, so trained staff can retrieve the eggs so they can be protected. Sea turtle nests are then relocated to the Reef Seen hatchery. Over the years, they have had green, hawksbill and olive ridley sea turtles. Reburied in a faux-beach, the baby turtles hatch as they would naturally, and then they are moved to holding tanks. Turtles are kept from two to four weeks in the holding tanks, because when they hatch, their shells are very soft. Keeping them safe while their shells harden, the turtles can then grow slightly larger and this will hopefully give them a better chance of survival in the open ocean. Widya Hapsari, Reef Seen’s Environmental and Social Project Coordinator (and a PADI Divemaster), gave me a tour of the facility. I will not lie; you could not wipe the smile off my face as I looked down at tanks full of baby sea turtles. Several nests had been hatching while I was there, and every morning, as I walked past the hatchery to breakfast, I could see a few little turtles crawling around in the sand. Sea turtle talks and tours of the hatchery are given every 30 minutes for a small donation, and if there are baby turtles, once a day, visitors can release one and receive a certificate (also for a small donation). These donations go back into the program to reward the locals for sharing information on turtle nests and injured turtles. Widya also introduced me to two adult turtles in the facility. The facility is set up to receive sick or injured turtles, and they try to rehabilitate the turtles there and then release them if possible. (Visitors can release adult turtles if they are ready for a donation too). If the problem is too severe, such as one sea turtle there with tumor disease (fibropapillomatosis), the staff try to get additional help for the animal. This turtle was headed for surgery elsewhere to try and save it. Feeling as if visiting an underwater temple and seeing baby turtles was enough to keep me happy for days, we headed out for our second dive to another artificial reef created by Chris and the Reef Gardeners, known as the Garden of the Gods. Bali is known as the island of gods and goddesses. 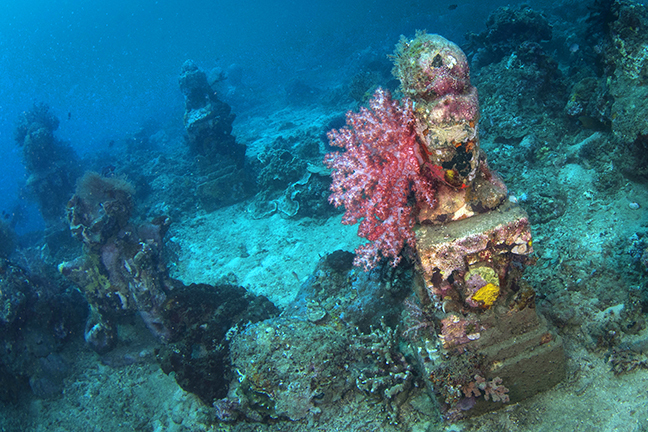 The Garden of the Gods artificial reef is based on the legend of Dewata Nawa Sanga, or the nine guardians of the compass or direction. Underwater, a statue of the main god, Shiva, sits in the middle of the temple on the back of a turtle (on land, Shiva drives a cow, but it makes more sense to be on a turtle underwater, and it also honors the turtle hatchery). Statues of the other eight gods—Brahma, Rudra, Mahadeva, Sangkara, Vishnu, Sambhu, Iswara and Mahesora—stand around facing the eight directions of the wind. Throughout the garden are statues of musicians and dancers, lanterns, benches and figures of marine life, including sea turtles. Giving divers and the local community the opportunity to participate, each statue was sponsored by guests or businesses. A similar concept as the Temple Garden, the Garden of the Gods was completed in 2014 with all the work being done by hand. Sitting directly offshore from Reef Seen, the statues were lowered to a sandy patch from the surface, and the Reef Gardeners positioned them and created the garden. 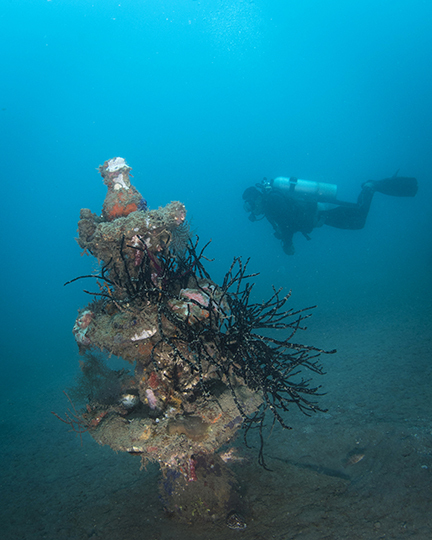 Only three years underwater, marine life is already growing in abundance on and around the statues. Diving the site was an incredible experience. What was once just a sandy patch was now an underwater temple that was attracting marine life and would continue to do so well into the future. Throughout the world, we build temples as places of worship and to honor deities. They are physical places that allow people to visit and show gratitude and respect to whatever they believe in, and they are places for like-minded people to gather together, to contemplate, or just to be. As divers, I think we need more of these places for us to come together and show gratitude and respect for the ocean. It was amazing to be on the island of Bali, the Island of Gods, and visit a temple (two, actually) underwater—a place where I personally have had many spiritual moments. I can see no better way to respect the ocean and the incredible spirituality and culture of Bali. I cannot wait to see how the ocean continues to decorate these underwater gardens throughout the years. The last diving day of my visit was spent checking out another Reef Seen/Reef Gardeners project called the “Bio-Wreck.” Just a five-minute boat ride in front of the resort, the area was previously devastated by cyanide fishing and crown-of-thorn starfish. 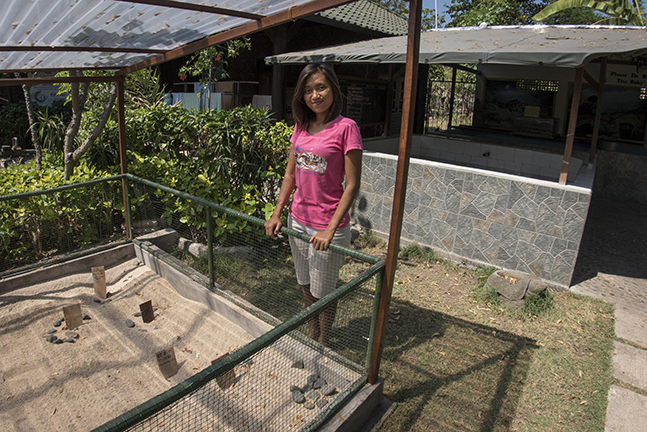 With an AusAID grant, the Reef Gardeners were able to set up a biorock artificial reef project. Creating artificial reefs by sinking objects to provide a place for coral to grow is not a new concept, but biorock technology takes that idea one step further. 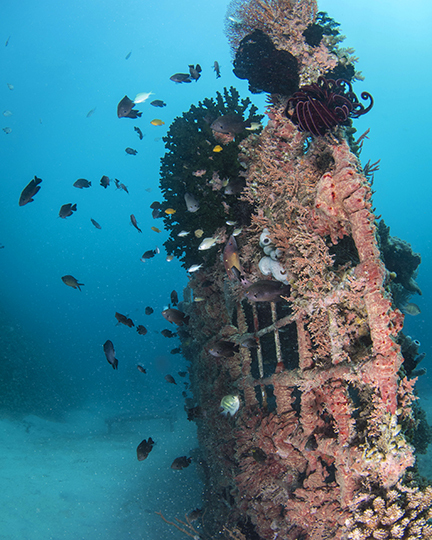 Biorock artificial reefs are becoming more and more popular around the world and have been set up in over 20 countries in Southeast Asia, the Caribbean, and the Indian and Pacific oceans. Their purpose is to encourage coral growth quickly and to provide a helpful boost to assist the reef survive environmental pressures. A conductive metal structure is sunk, usually made from rebar and wire mesh, and a low voltage direct current is applied. A small floating solar panel can be seen on the horizon off Reef Seen’s beach, which creates the electricity to power the Bio-Wreck. Structures shaped like a turtle and a boat frame were sunk, one in 2005 and one in 2009. I was told that this technology worked best when there was some natural coral reef nearby. In between the turtle and boat structures was a large coral reef area loaded with fish and covered in coral. By using a small amount of electric current, salt water is electrolyzed and minerals are dissolved in the water, which then adhere to the structures. Those minerals attract and facilitate coral growth, and create a cement-like base for the adhering coral. Divers transplant coral fragments, attaching them to the frame. Research has shown that biorock reefs grow three to five times faster than coral does naturally, that these reefs further strengthen over time, and that they are more likely to survive during times of environmental stress. At the Bio-Wreck site, the boat mooring is located close to the solar panel float. Divers can descend to a mooring line leading to the turtle structure in the sand. Swimming around the turtle structure, one can see the coral growth and fish life around the structure. 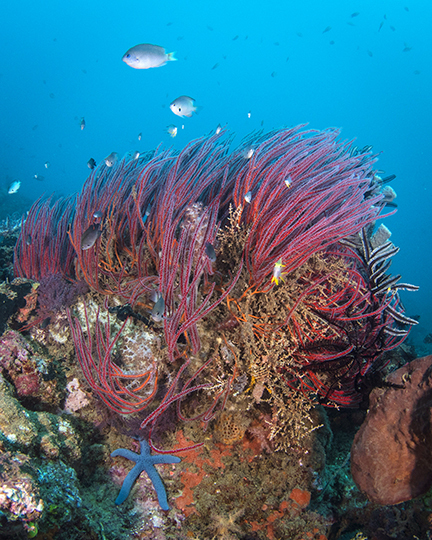 The dive then continues to a small wall-like reef with massive barrel sponges and gorgonian fans. Further exploring the natural reef, one will eventually come to another sandy patch where the boat structure is located. The boat structure has been submerged for a longer period than the turtle structure, so it has considerably more coral growth on it. 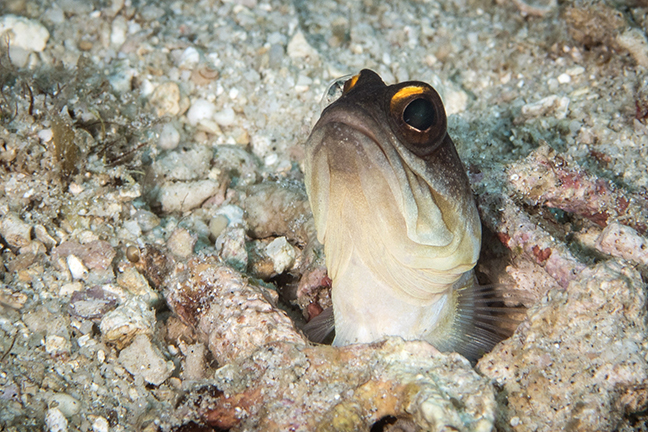 Fish can be seen inside and around it; although, in some parts, the coral is thick enough that you can hardly see inside. It is impossible not to see the sparkle in Chris’s eye when he talks about his resort. He found an unknown paradise 25 years ago and opened the first dive shop in the area. As tourism has increased over the years, he chose not just to operate a business but to work with the community in making it a better place. Managers Amanda and Adrian keep the show running, and their friendly demeanor makes you feel like you are at home as soon as you arrive. Amanda’s dive briefings were so spot-on, it was almost uncanny how we saw everything she described we would. There is a beachfront snack bar where breakfast is served as well as sandwiches, ice-cream, beer and other light meals throughout the day, and there are plenty of restaurants nearby. There is also a spa on the property and the ladies give fantastic massages. The dive operation is a PADI 5-star resort, and they teach Discover Scuba, open water and advanced dive courses. Dive sites are, for the most part, just a short five- to ten-minute boat ride from the resort, with the boat returning after each dive so that divers can have long, relaxing surface intervals. 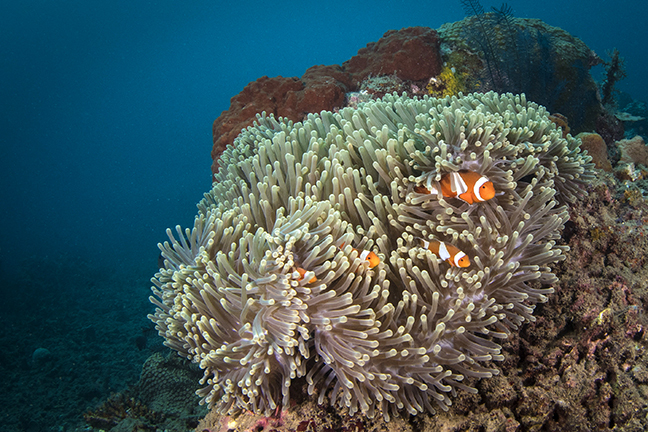 Reef Seen also does day trips for divers and snorkelers to Menjangan Island, which is part of Bali Barat National Park—an area known for its beautiful coral reefs. The island is a one-hour boat ride away, and I heard it was great diving, although I ran out of time before getting there. Snorkeling trips are also available. The area around Reef Seen is also very nice. I walked around town enjoying how much more laid-back and quiet it was compared to other parts of Bali. Many restaurants and spas line the beach and main road, and after a long walk, it dawned on me that not once had a tourist tout come up to me. No one offered me a taxi or asked me to come into their shop and “look,” or approached me in any way. The taxi drivers were still there, the shopkeepers were still there, yet they only said "hello" and smiled at me. It was very pleasant compared to being bombarded in other areas of Bali. It was sort of funny. I had been told about a secret, quiet, peaceful place on Bali, which Reef Seen was, but also it turned out to be a place full of activity in terms of conservation. Whenever I visit dive operations such as Reef Seen, I am reminded of the important role divers as consumers play in conservation. 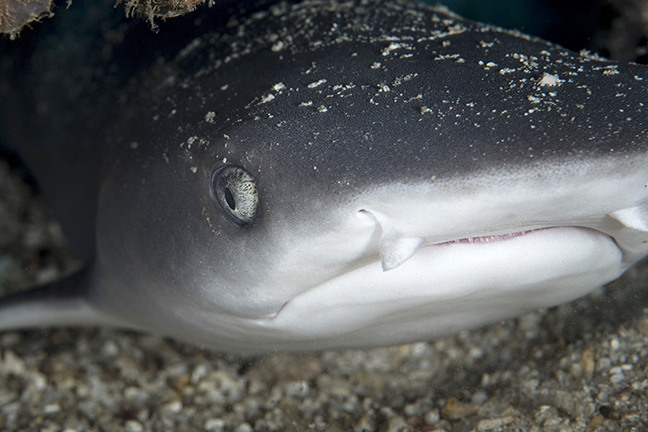 Even those of us who only dive occasionally, or who live many miles from the ocean, can help conservation efforts by choosing to dive with a company that is actively working on conservation efforts. By supporting dive operations such as this with consumer dollars, we help them to continue to do the work they are doing.